Lots of practise is needed when learning to count to 100, or even 200, and all that repetition may begin to get boring. The counting time around Halloween NEVER needs to be boring. There is an abundance of candy readily available for counting. Students love to handle it and will count into the hundreds willingly, and for longer periods of time. Hold the audience’s attention by promising a candy to the person who first hears any mistakes by the “counter”. Correct counters also get a treat. Each student counts about 20 numbers. All ears and eyes are on the counting. Practise counting by 2’s, 5’s, 10’s as well. about 300 separately wrapped candies (ask children and/or parents to bring in 10 each to use) **SAVE THE WRAPPERS AND CANDY BOXES TO USE FOR LESSON CALLED “Learning Healthy Eating With Junk Food Jack and Healthy Harry“. one large bowl (for putting counted candy in) and one large box (to hold candy before and after counting). Explain that when they count 20 pieces, they can have one treat. If they hear anyone else make an error, the first person to notice can have a treat as well. Everyone gets one turn to count. Remind students not to say “and” after one hundred. Example, “one hundred, one”. The student of the day begins counting “1, 2, 3, 4, 5, 6, 7, …18, 19, 20.” (or 2, 4, 6, ….or 5, 10, 15…. or 10, 20, 30….) Good job, they get one treat. Everyone’s listening and paying attention because they want a treat too (if they hear an error). ***When counting by 2’s or 5’s, have the 2 candies or 5 candies in hand before dumping them in the bowl and adding them to the count. Eg. count out the 2 candies into the palm of your hand, then add them to the bowl saying 2, then count out 2 more into your hand, then put them both in the bowl saying 4, etc. Teacher can put 5 or 10 in student’s hand if confusion arises. 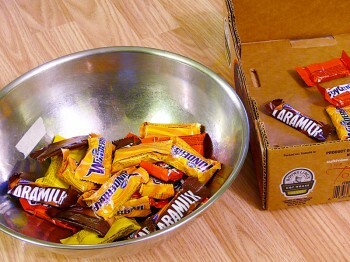 Pour the bowl of treats back into the box and remove the masking tape from the bowl. Keep the treats and do the class counting again later, until you have less than 100 treats, then let students have one treat each at recess or before home time until the treats are gone.